Both the Arctic and Antarctic are experiencing noticeable changes in climate attributed to human induced climate change and global warming. The Arctic Sea Ice extent is still shrinking according to NASA and the National Snow and Ice Data Center. While the collapse in early April of an ice bridge of the Wilkins Ice Shelf in the Antarctic Peninsula has raised the growing impact of global warming on polar regions. According to NASA Arctic Sea Ice extent is still showing a shrinking trend. The thickness of Arctic ice is also reducing. Over the 2009 winter the Arctic had the fifth lowest maximum ice extent on record. The six lowest maximum events since satellite monitoring began in 1979 have all occurred in the past six years (2004-2009). According to scientists Arctic sea ice works like an air conditioner for the global climate system. The Sea Ice cools air and water masses, playing a key role in ocean circulation, and also reflects solar radiation back into space. Arctic Sea ice also helps refrigerate the Greenland Ice Cap to keep it cold and stable, although research is showing substantial warming changes to the coast of Greenland. Information on the trends for Sea Ice Cover was provided in a media conference on April 6 by Ronald Kwok, research scientist, NASA's Jet Propulsion Laboratory; Walter Meier, cryosphere scientist, National Snow and Ice Data Center, University of Colorado; and Thomas Wagner, cryosphere program manager, NASA Headquarters, Washington. Reasearch in 2008 revealed substantial warming on Greenland's north coast with the ice sheet experiencing extreme melting. The average temperature between June and August 2008 was as much as 3 degrees Celsius above average at ground based weather stations. Ice sheet models from 2006 project that warming would initiate the long-term melting of the ice sheet, leading to a complete melting of the Greenland ice sheet over several millennia, resulting in a global sea level rise of about seven meters. According to a team of researchers led by University of Wisconsin-Madison geologist Anders Carlson sea level rise from greenhouse-induced warming of the Greenland ice sheet could be double or triple current estimates over the next century. "We're not talking about something catastrophic, but we could see a much bigger response in terms of sea level from the Greenland ice sheet over the next 100 years than what is currently predicted," said Carlson in a report in Science Daily in September 2008. In early April 2009 the Wilkins Ice Bridge connecting Latady and Charcot Island on the Antarctic Peninsula collapsed. The disintegration of this ice bridge will allow the further disintegration of the Wilkins ice shelf. A large part of the Wilkins Ice Shelf disintegrated in February 2008. 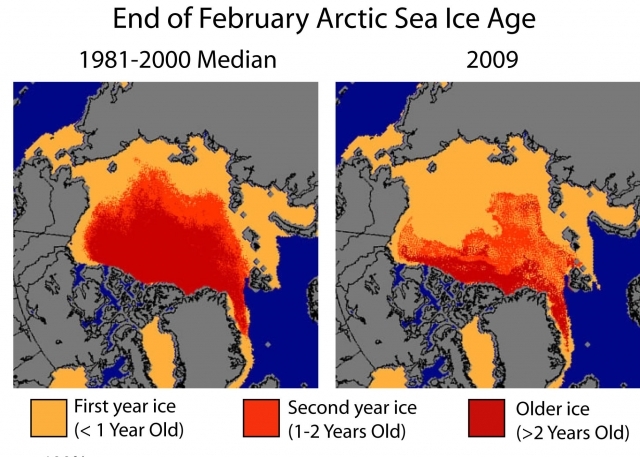 As this ice is already floating on water, the subsequent melting will not affect sea levels. Neither does the Wilkins Ice Shelf buttress any major glaciers that would increase speed and thus contribute to increased sea levels. However the breakup is symptomatic of increasing warming being felt in the Southern Ocean and particularly the Antarctica Peninsula and West Antarctica. Ted Scambos of the National Snow and Ice Data Center said that many factors contributed to the collapse of the ice shelf, including brine on the ice, physical stresses on the shelf, and warming temperatures. Over the previous 50 years, the Antarctic Peninsula has experienced a temperature increase of 0.5 degrees Celsius (0.9 degrees Fahrenheit) per decade, making it one of the fastest warming places on Earth, according to the National Snow and Ice Data Center. "Everyone knows it has been warming on the Antarctic Peninsula, where there are lots of weather stations collecting data," said Eric Steig, a climate researcher at the University of Washington in Seattle, "Our analysis told us that it is also warming in West Antarctica." Eric Steig used satellite data and statistical analysis to confirm the warming trend as data collection on the ground is restricted to primarily the few ground-based weather stations around the coast of Antarctica. West Antarctica is particularly vulnerable to climate changes because its ice sheet is grounded below sea level and surrounded by floating ice shelves holding back several glaciers. If the West Antarctic ice sheet completely melted, scientists estimate global sea level would rise by 16 to 20 feet (5 to 6 meters). The Wilkins Ice Shelf is the tenth major ice shelf to collapse in recent times. The Larsen B ice shelf rapidly and spectacularly collapsed in 2002, allowing the pent up glacier ice to more rapidly discharge.